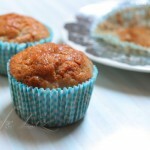 Trendy western baked goods meet traditional local flavors in these rose-scented cupcakes – a delicate whiff of rose gives these cupcakes a dreamy, Middle Eastern flavor where you least expect it. Rose and pistachio, a combo frequently found in baklava, mesh seamlessly with the buttery crumb, and create an elegant dessert that’s food-coloring free. One of my biggest impediments to baking, aside from the sweltering heat, has been my lack of a stand mixer — many recipes call for beating the batter on X speed for Y number of minutes. But lo and behold, you can bake to good results even without this expensive appliance. It’s just a matter of doing things the old-fashioned way, before people had electric mixers — by hand. Sure, it’s tiring, but it’s absolutely feasible, and I did it. My cupcakes were lovely, too — light and fluffy and full of air. Given my lack of stand mixer, I’ve found this to be the next best option — no other household appliance I own is up to the task. That said, an important part in making these cupcakes come out as good as possible is technique. It’s not enough to mix the ingredients together, dump the batter into cupcake tins and bake until done — you need to let the ingredients warm up to room temperature before you begin, you need to beat the butter and sugar for the stated number of minutes until light and fluffy, you need to bake at the right temperature (and not at a higher one), and you need to let the cupcakes cool outside the cupcake tins once they’re cool enough to handle (otherwise, they’ll get soggy from condensation/steam). You also need to wait until the cupcakes are cool to frost them — otherwise, steam will be trapped under the icing and they’ll get soggy. These are all integral parts of the recipe. These cupcakes use rose essence, not rosewater. There’s a huge difference — rose essence is much more concentrated. While rosewater is much more readily available, these ingredients are not interchangeable — if you were to use rosewater instead, you’d have to use a full cup in order to taste the rose flavor, and that quantity would more than alter the batter’s texture. So thus, rose essence. I bought mine from the spice shop where I buy my coffee, Atlas/David’s at Levinsky 49, and it came in a tiny 8 milliliter vial. I used half of it to make these cupcakes, and a few drops to flavor the icing. I topped my cupcakes with a buttercream frosting. While this kind of frosting is too sweet and heavy for many people, particularly non-Americans, I tried to use a non-overwhelming quantity of sugar, and I also put very little frosting on each cupcake — just enough to cover the tops. If buttercream is not to your tastes, feel free to use an alternative; I’m open to suggestions, since I haven’t found something else that goes well with these cupcakes. 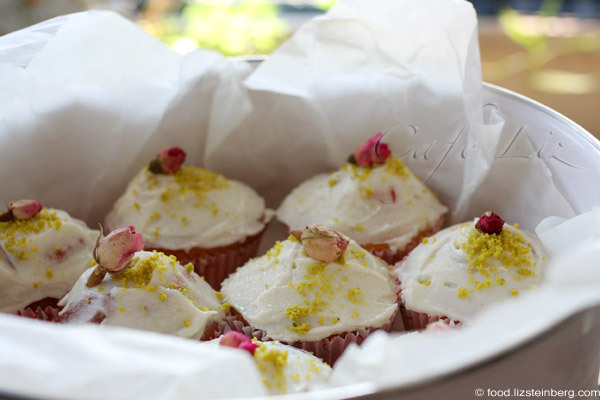 The decorations on these cupcakes are completely natural — pistachios make for a natural source of green sprinkles, and tea-grade rosebuds are a surprising, elegant touch. No food coloring needed. As a base for my recipe, I started with the vanilla cupcakes from More from Magnolia and altered the flavoring, the flour and the liquids (OK, most everything). While I may have changed a lot ingredient-wise, the book’s instructions were quite useful. In general, the book has some great basic baking guidelines. First, start with room-temperature ingredients. If your oven needs preheating, preheat it to 175 degrees Celsius (350 Fahrenheit). Beat the butter until soft, smooth and creamy. Slowly add the sugar, and then beat until white and fluffy — about three minutes (or more, if your hand gets tired and you need to take breaks). Beat in eggs and incorporate thoroughly, until the batter is glossy and yellow. Now start adding the liquids (rosewater, yogurt and milk) and the dry items (flour and baking powder). Add gradually, alternating dry and wet, and mix only until incorporated. The acidity from the rosewater may curdle the milk, but that’s OK.
Scoop into cupcake-paper lined tins. I put a little less than 1/4 cup in each paper. 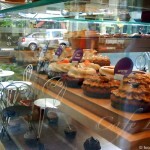 Filling nearly to the top will give you a domed cupcake; filling only 2/3 will give you a flat cupcake. Bake at 175 degrees Celsius (350 Fahrenheit) for about 20 minutes, until the cupcakes are baked through — a toothpick inserted into the center should come out dry. 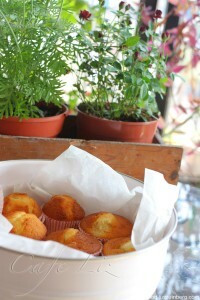 Once the cupcakes are barely cool enough to touch (about 15 minutes), remove them from the tins. Then, leave them to cool entirely. Let the butter warm up to room temperature. Beat until soft and creamy. Slowly mix in the powdered sugar, and beat until light and fluffy — about three minutes. Add the flavoring of your choice — rose essence or vanilla. Grind the pistachios (I used a coffee grinder). Once your cupcakes are cool, apply the icing with a knife. 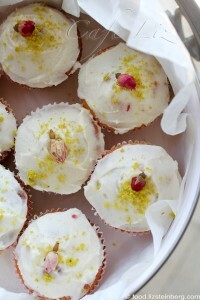 Top each cupcake with a dusting of ground pistachio and a rosebud. 9 Responses to "Rose-flavored cupcakes"
Your cupcakes look lovely! I love making them too,but usually make vegan ones,which is a bit of a challenge,but the outcome usually is very good. Is that rose essence the same which is called zohar essence?In those tiny small bottles? Rose essence is a close cousin of zohar essence. Zohar is citrus blossom essence. But yes, they come in the same tiny bottles. Nice cupcakes. I bought a bag of dried roses a few weeks ago, this would be a nice use for them. I tend to like cream based frosting better- perhaps a mixture of cream and white chocolate so that it holds its shape. Sarah, it seems like your frosting option is definitely one of the more popular around here — from what I’ve heard, at least. I wonder if I would like it, since I find white chocolate to be too sweet — which is kind of funny, because the whole issue is that buttercream frosting also tends to be too sweet. I used a bit of red food coloring to make my icing pink 🙂 Can’t wait to bring them in to work! The taste kind of confuses me, it is a very light flavor, I feel like I smell it more than I taste it, but it tastes exactly like roses smell, very nice. These are absolutely amazing! I can’t get enough of them! Rose essence is something very special in our family, my grandma used to spray rose oils on our bed sheets, towels… The smell and taste are so unique and delicious!!! Thank you for this recepie! I made it many times and people were amazed! Better than I ever bought in any bakery! Fresh, soft, moist! Fantastic!!! Now trying to figure out a version for my one year old son who has egg allergies but I am trying to make it with more buttermilk vs eggs instead. Hey Nadya, great to hear! It’s always nice to know when recipes work out. Good luck with the egg-free version. i have a suggestion for your rose cupcakes. 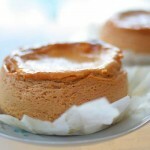 Use 1 package cream cheese, 1/4 cup of powder sugar, 1 tsp. milk, add a little rose essence and 1/2 tsp. vanilla . Mix well. After everythingis mixed add half cup of whipped cream. Mix with spoon . It makes a delicious light , not too sweet rose flavored icing. I sometimes use this for scones.